KANGERLUSSUAQ – Kangerlussuaq International Science Support is a red, boxy building that doubles as a laboratory and a hotel for polar researchers. Upon my arrival it was quiet, nearly empty. By the end of the week, however, an influx of scientists staging field expeditions quickly filled the kitchen and halls. 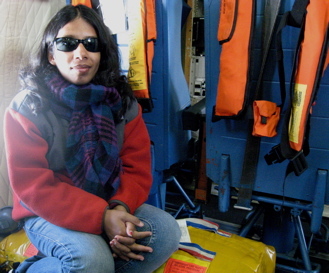 Space is limited, so I share a room with Indrani Das, an ice scientist from Columbia University’s Lamont-Doherty Earth Observatory — the only other woman with the IceBridge team here in Kangerlussuaq. She works with the Gravimeter instrument, which measures the shape of seawater-filled cavities at the edge of some major fast-moving major glaciers. Das, looking out the P-3’s window on the flight to Greenland’s Helheim and Kangerdlussuaq glaciers, has expertise that reveals a world hidden from my untrained eyes — textures in the ice that disclose, generally, how a glacier is moving. Das wrote about her experience on the flight May 8, sprinkling her narrative with some glacial facts. Read her post here, on the Lamont-Doherty Earth Observatory’s IceBridge blog. Next Next post: An Inland Connection?